If there’s one thing I love, and there are many, it’s soup. Preferably on the couch, wrapped in a blanket, with the heating on, and while it’s raining outside. Well that’s my ideal way to eat it, but I’ll also happily eat a bowl of soup even if it’s scorching hot outside. I’ll choose a hot bowl of creamy vegan vegetable soup any season, any day. This creamy vegan soup was inspired by one of my sister in-laws. 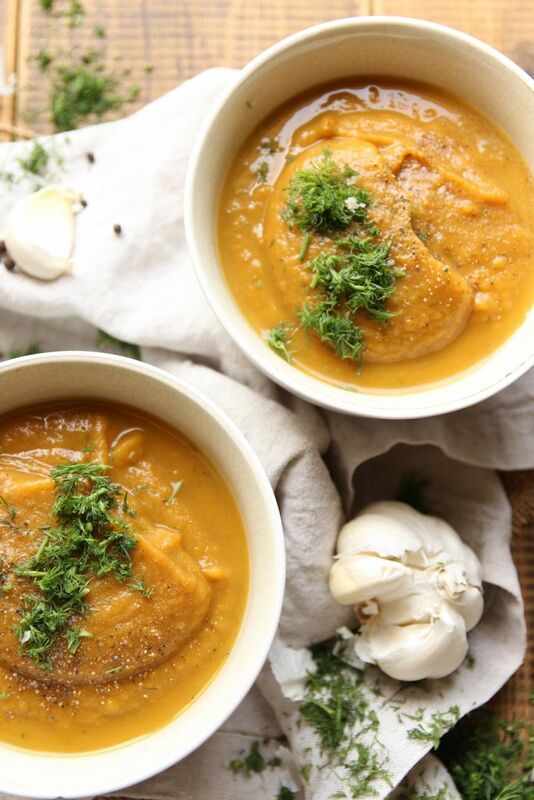 A few years ago, she prepared a huge pot of sweet potato soup with chestnuts, and since then I’ve wanted to recreate it, while also adding my own twist. So, with that in mind I kept the color of the soup and the chestnuts, added plenty of orange colored vegetables, and kept the seasoning as simple as possible. I began by frying the vegetables with a bit of olive oil, added water and seasoned with sea salt and black pepper, then I added peeled chestnuts and let the soup cook until the veggies were nice and soft. When the soup was ready, I added a generous handful of fresh dill, and blended all that goodness together until it was well combined. 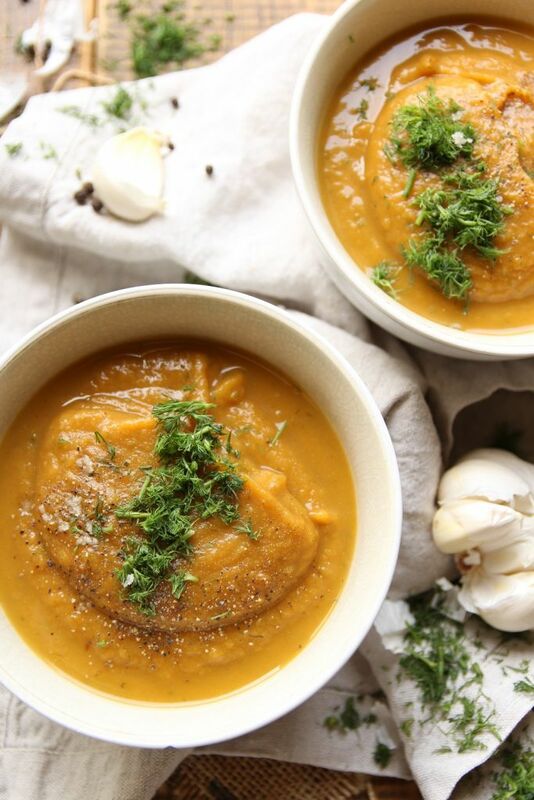 Finally, I tasted and adjusted the seasoning, then snuggled up with my comforting bowl of this vegan vegetable soup, while I watched as the rain continued to heavily pour down the windows of my home. 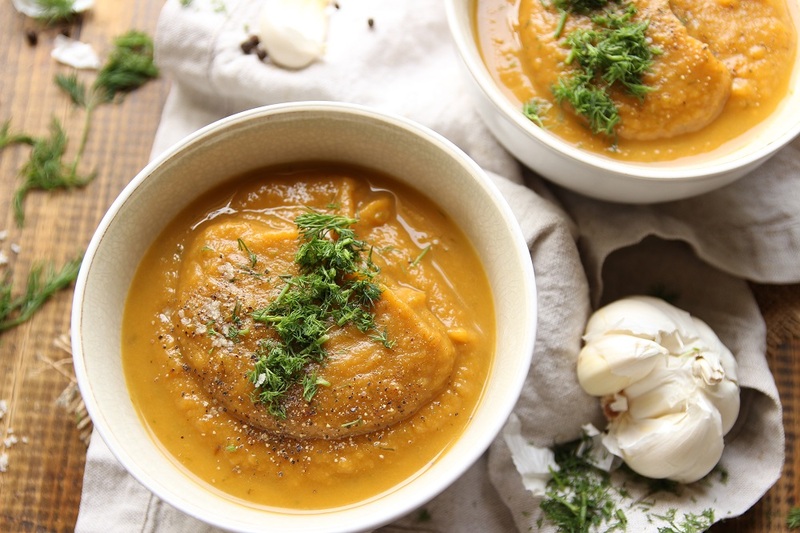 Creamy Vegan Vegetable Soup With Chestnuts And Fresh Dill! Peel and dice the onion, finely slice the leek, removing and discarding the top green portion. Heat a pot on medium heat, add the olive oil along with the onion and leek, and cook, occasionally stirring, until the onion starts to sweat. Peel and crush the garlic cloves, and add to the pot. Cut the butternut pumpkin in half, peel it, and remove the inner seeds. Roughly chop and add to the pot. Peel the sweet potatoes and carrots, roughly slice and add them to the pot. Add the vacuumed chestnuts, and cook for a few minutes, occasionally stirring. Add the water, and season with sea salt and black pepper, bring to a boil, then lower the heat and cook until the vegetables are nice and soft, around 20 – 30 minutes. When the vegetables have softened, remove from heat and blend until smooth. Finally, add the fresh dill, taste and adjust seasoning if needed, and briefly blend again. Serve your vegan orange soup with croutons, freshly chopped dill, black pepper, a dollop of coconut yogurt, or on its own, and enjoy! What’s For Dessert? 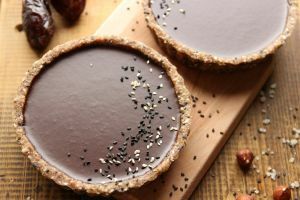 My vegan No Bake Tahini Infused Chocolate Black Sesame Tarts are perfect for any occasion. ← Baked Broccoli Quinoa Patties – Vegan!